Cincinnati, OH (February 9, 2011) – Kett Tool, leading producer of electric and pneumatic portable power saws, shears and nibblers, introduces the KD-200 double-cut shears. The KD-200 cut C.R. mild steel up to 18 gauge in straight or contour lines at over 300 inches per minute and stainless steel up to 20 gauge at over 180 inches per minute. The swiping action of the KD-200 blades seals the edge of coated metals, and the 7/32" waste strip leaves a clean cut. 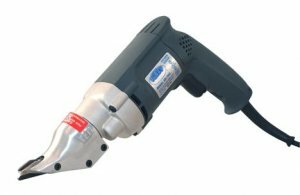 The KD-200 are ideal for fabricating and general manufacturing work. Portable and weighing in at only four pounds, the KD-200 permit fast cutting of C.R., sheet pipe and corrugated mild steel and aluminum. Maintenance and repair shops also use them for fast, burr-free cutting of sheet steel, pipe and aluminum. The KD-200's minimum cutting radius is six inches. The KD-200 shears are also available with a contour cutting blade KD-200C for those wanting to cut together curves and with the HS blade KD-200HS for cutting foam filled doors. ABOUT KETT TOOL COMPANY: Formed in 1940, Kett Tool Company produces electric and pneumatic portable power saws, shears and nibblers to cut a wide range of sheet material used in various applications. Kett Tool has dealers located in every state in the USA. To learn more about Kett, please visit www.kett-tool.com or call (513) 271-0333.